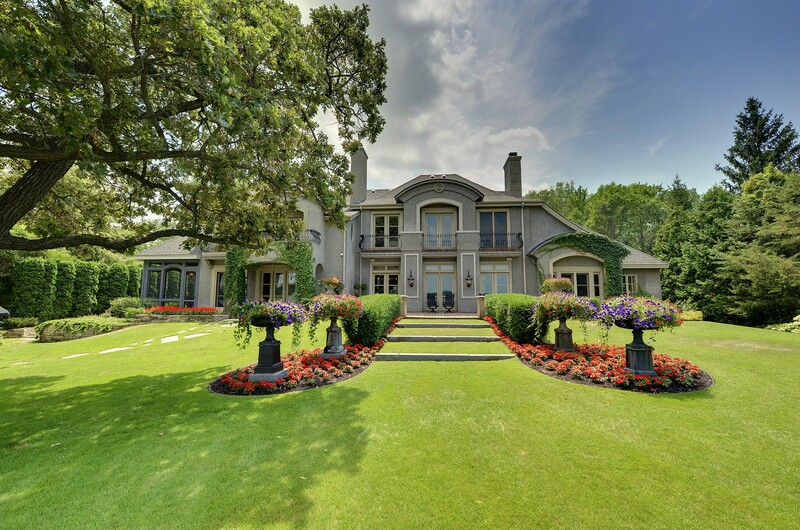 Very classic and timeless one owner, European style home situated on 2.23 park-like acres with 170 feet of level lakeshore on Wayzata Bay. Gorgeous entrance with long curved driveway, aerated pond with fountain, tranquil man-made waterfall, exquisite landscaping and paver courtyard. Inside you will find beautiful dark-stained, quarter sawn, distressed white oak floors, wide coffered ceiling in foyer, heavy crown molding and formal honed travertine wet bar. Luxurious owner’s suite on main floor with the most fabulous separate owner’s bath areas and his and hers closets. Stunning living room with exquisite aged stone wood burning fireplace, elegant dining room and gourmet kitchen with antiqued ivory cabinetry. Adjacent to this is a comfortable family room with Empire marble gas fireplace, second office with built-ins and enchanting beamed screened lakeside porch. Two upper level guest suites with private baths and balconies, spacious office/sitting room (could be 4th bedroom) with views of the lake, large exercise room and convenient gift wrapping room. All this within 2 minutes from downtown Wayzata!